This week we feature an inspiring quote from ancient Greek philosopher, Socrates. Born around 470BC, Socrates was an ancient Greek Philosopher. Perhaps his most important contribution is his method of inquiry, known as the Socratic method. To solve a problem, it would be broken down into a series of questions, the answers to which gradually distill the answer a person would seek. This approach is still widely used by many to this day. 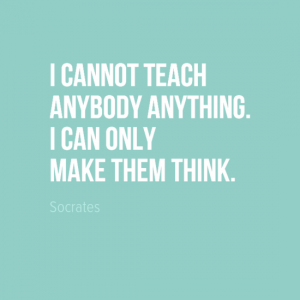 Interestingly, Socrates did not write down any of his thoughts and ideas – everything we know about his teachings comes from the work of others.